Effectiveness depends on returning on time: Risk of pregnancy is greatest when a woman is late for a n injection or misses an injection. 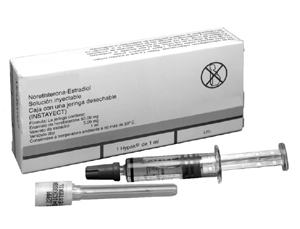 As commonly used, about 3 pregnancies per 100 women using monthly injectables over the first year. This means that 97 of every 100 women using injectables will not become pregnant. When women have injections on time, less than 1 pregnancy per 100 women using monthly injectables over the first year (5 per 10,000 women). Return of fertility after injections are stopped: An average of about 5 months, one month longer than with most other methods (see Question 11).